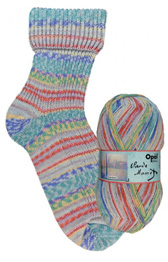 Opal Monet sock yarn 9681 House in Giverny is a 4 ply self patterning sock knitting yarn. 75% wool and 25% polyamide. 100g, 425mtrs. 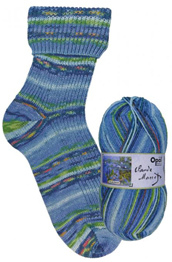 Opal Monet sock yarn 9682 Water Lillies is a 4 ply self patterning sock knitting yarn. 75% wool and 25% polyamide. 100g, 425mtrs. Opal Monet sock yarn 9683 Woman with a Parasol is a 4 ply self patterning sock knitting yarn. 75% wool and 25% polyamide. 100g, 425mtrs. Opal Monet sock yarn 9684 Japanese Bridge is a 4 ply self patterning sock knitting yarn. 75% wool and 25% polyamide. 100g, 425mtrs. 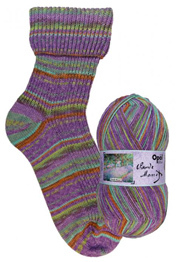 Opal Monet sock yarn 9685 Chrysanthemums is a 4 ply self patterning sock knitting yarn. 75% wool and 25% polyamide. 100g, 425mtrs. Opal Monet sock yarn 9686 The Grand Canal is a 4 ply self patterning sock knitting yarn. 75% wool and 25% polyamide. 100g, 425mtrs. Opal Monet sock yarn 9687 Irises in Monet's Garden is a 4 ply self patterning sock knitting yarn. 75% wool and 25% polyamide. 100g, 425mtrs. 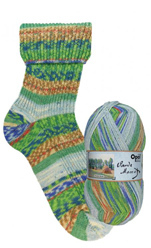 Opal Monet sock yarn 9680 Barn in Giverny is a 4 ply self patterning sock knitting yarn. 75% wool and 25% polyamide. 100g, 425mtrs.